It all began when I was five years old and first drove a kart. From then on I would go to Sandown kart circuit as much as possible with my Dad until I could get my ARKS license at seven years old. I had my first race in cadets on my eighth birthday winning summer and winter club championships and third place in the national championship. Progressing into International karting I raced in many parts of the world and in 2006 won the British ICA championship and Italian Winter Cup. During these years I also had to work hard on my education at Reed’s School. With a large amount of support from the school, I managed to complete my education with nine GCSE’s including A-Grades in both Maths and Physics, two subjects very closely related to Motorsport. In 2008 I made the move to single-seater cars and immediately gained a BMW scholarship after setting the quickest time at the licensing and scholarship course in Valencia, against 63 other drivers. The same year I was made an MSA Race Elite Academy driver and completed my first season in Formula BMW, alongside Formula 1, taking two podium finishes in my debut season. After doing a second season in Formula BMW I decided it was time to come back to the UK and chose to race in Formula Renault UK with Manor Competition, the most successful team in the history of the championship who ran Lewis Hamilton and Kimi Raikonnen, achieving 6 podium finishes. 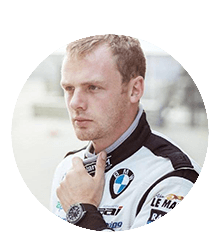 In 2012 I made the decision to switch to GT racing and was signed by legendary sportscar team Ecurie Ecosse to lead their Pro-Am driver lineup in the Blancpain Endurance Series, arguably the hardest GT championship in the world. Having had a very successful debut season, I stayed with the team to compete in the 2013 European Le Mans Series, in which finished 3rd in the driver’s championship. 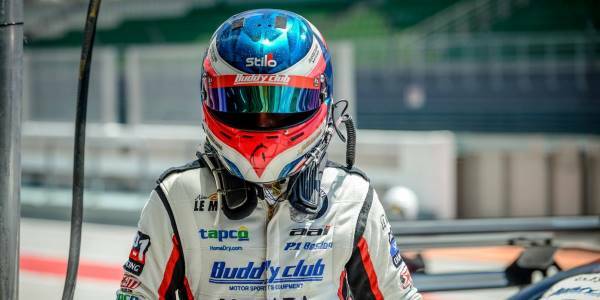 I was then selected by Taiwanese team AAI Motorsports to lead their driver lineup in a BMW Motorsport Z4 GT3 for the 2014 and 2015 Asian Le Mans Series, in which I accumulated multiple podium finishes and a win in the team’s championship. When I am away from the circuit I work hard on my fitness, which is a very important part of my job. I am also a very keen golfer, which is not only very challenging but requires a lot of concentration. As one of the hardest mental sports in the world it’s a great way of training my mind for high pressure race situations. I also enjoy spending time with my friends and family, who are very supportive of my racing. When I’m not racing or training I am a driver coach and also mentor junior drivers to help them develop their skills on and off the circuit using my experience. I also work for various high profile car manufacturers as a precision driver in their promotional initiatives including television and films such as Mission Impossible and London Has Fallen.